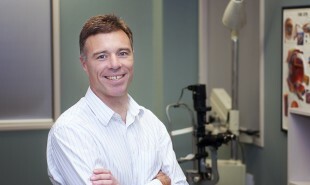 Stephen graduated with a medical degree from the University of London in 1989, before moving to New Zealand and training in general ophthalmology in Auckland and Hamilton. He then worked at Moorfields Eye Hospital, London for 6 months doing a fellowship in Uveitis before heading to the USA, and completing a 2 year fellowship in Vitreoretinal surgery and diseases of the retina. Stephen has performed thousands of retinal surgeries and cataract operations. He has extensive experience in macular surgery, retinal detachment surgery, complicated lens surgery and management of macular degeneration. Other services provided by Stephen at the Hamilton Eye Clinic include retinal laser, intravitreal injections, retinal angiography and photodynamic therapy. Stephen is a consultant ophthalmologist at Hamilton Eye Clinic and Waikato Hospital Eye Clinic where he was Clinical Director from 2008 – 2014. He is a senior lecturer for the University of Auckland Department of Ophthalmology and is regularly involved with training medical students, and junior ophthalmologists. In 2011, 2013 and 2015 he received awards from the Royal Australian and New Zealand College of Ophthalmologists for Excellence in Training. Furthermore, Stephen holds memberships and affiliations with ophthalmology societies in New Zealand and overseas including the American Society of Retinal Surgeons. He has been author or co-author of numerous peer reviewed papers in the areas of retinal disease and uveitis. Stephen’s interests outside the world of ophthalmology include being with family, trail running, sailing and tramping through the more remote parts of New Zealand with wife Liz.